In many ways, the Barlow girls soccer team accomplished almost everything it set out to do in 2018. The Bruins battled to second in the tough Mt. Hood Conference, they stitched together their best record in a very long time and they played their way into the Class 6A state quarterfinals for the first time since 2007. But second-ranked West Linn ended Barlow's run there, scoring twice in the second half, notching a double-digit edge in shots on goal and riding that effort to a 2-0 victory at West Linn High School. While disappointed with the loss, the Bruins celebrated their first quarterfinal appearance since 2007 and their best overall record in well over a decade. "I think this year, we all bonded a lot more than we have before," said senior goalkeeper Lisa Martin, who helped keep the Lions off the scoreboard for almost 53 minutes and also made a dozen saves. "We all hung out with each other and we all connected. There wasn't drama on the team as we've had in past years. Without the drama, it really helps us be more together." "Just getting to the third round was a big thing for us. It hasn't happened for a long while," said Barlow sophomore forward Abi Hoffman. "This was a huge accomplishment for us, so I want to thank all the seniors for coming out and doing what they do on a day-to-day basis, pushing hard and getting us to where we needed to get to." With the loss, No. 7 Barlow saw its six-game winning streak snapped and ended the year with a 14-2-1 overall record after placing second in the Mt. Hood Conference. West Linn, meanwhile, notched its 15th straight win, improved to 16-0-1 overall and advanced to the state semifinals against third-ranked Mt. Hood Conference champion Clackamas at 7 p.m. Tuesday. "It's just pure elation right now," said senior midfieder Calli Masters, who assisted on her team's first goal. "This has been one of our goals since the start of the season. We started out in August and it means so much that we finally got here and accomplished it." "We definitely knew coming into this game that we needed to be strong," added junior forward Rosie Larsen, who scored the Lions' first goal on a header with 28 minutes left to play. "The final eight is tough — it's going to be tough — but we knew what we needed to do. We just needed to put this one in the bag." 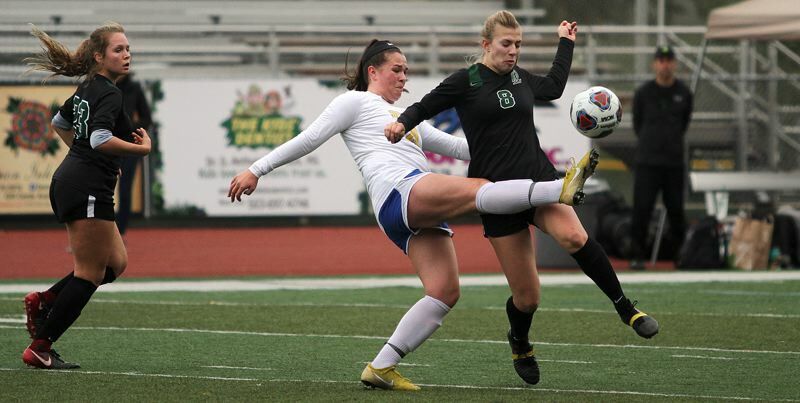 Neither team made much headway in the early going Saturday, with West Linn getting early shots from senior defender Rae Peters and junior forward Carmel Corrigan, and the Bruins getting a volley by sophomore midfielder Rianna Strain that missed wide and a pair of shots from Hoffman. West Linn held the upper hand in the latter portion of the half, though, getting a dangerous free kick from junior forward Jill Brody with 22 minutes to go, a Peters shot that rebounded off the left post 14 minutes before the half, a tough angled shot by Peters that Martin stopped with 12 minutes remaining in the period, and finally, a rebound shot by junior midfielder Abby Schmidt rejected by Martin with 1:40 to go. While frustrated by the Bruins' defense in the opening period, the Lions just kept pushing in the second half. First, it was Peters setting up Larsen for a shot knocked away by Martin and Schmidt's rebound attempt deflected away five minutes into the half. Next, it was Peters making a run up the right seam for a hard shot that forced a diving Martin stop, another Peters shot that Martin blocked while still on the ground, and a block by senior defender Hannah Rispler on a Schmidt follow a minute later. "I'm really proud of our defense this year," Martin said. "Everyone connected really well. They are part of the core of the team. They keep us together." But Barlow's luck finally ran out with 27:57 left on the clock when Masters sent a long free kick toward the right side of the Bruins' goal and Larsen found room in a crowd to head it home for a 1-0 lead. "I had no idea I actually scored," Larsen said. "I just kind of tried to get something on it and I guess it happened to go in." "It was a bit frustrating to know that we were dominating but not scoring, but it was so close — it was so close," Masters said. "We knew that we were going to get one eventually." Barlow's Monica Gifford managed a shot on goal off a corner kick just over a minute later, and the Bruins added another attempt on goal 10 minutes after that, but each time, West Linn senior keeper Alyx Burkhartzmeyer was up to the challenge. Then, with 10:54 to go on the clock, West Linn junior midfielder Carmel Corrigan made a run up the right side and angled a shot past Martin that bounced off the far post and from there, Lion junior forward Lauren Jones tapped home the rebound for the final 2-0 margin. "You've just got to score. You've got to put it in the back of the net, finish our chances," Larsen said. "That's something we've kind of been struggling with, but that's all we needed to do was to score." Despite the loss, the Bruins knew they'd put together a special season. "I'll remember our seniors and everything they put forth," Hoffman said. "Being a senior this year is going to stick out the most because we bonded more than we have in the other three years and we made it super far because of the strength of our team," Martin added. The loss marked the final game for Barlow seniors Gifford, Joanie Holland, Rispler, Martin and Callie West.